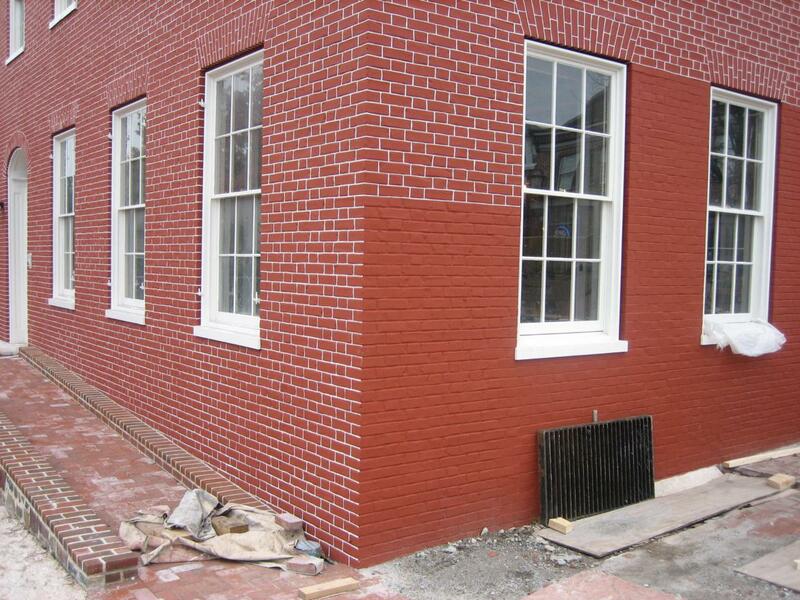 The white stenciling around the red bricks on the west side of Gettysburg’s David Wills House is progressing well, despite the recently inclement weather. This view was taken from the west facing east at approximately 4:45 PM on Tuesday, October 28, 2008. 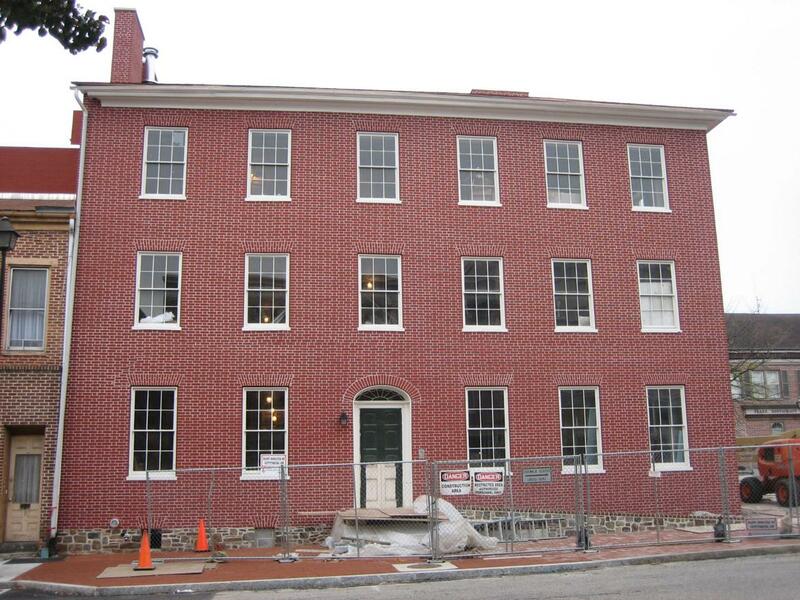 The David Wills House, where President Abraham Lincoln stayed the night before giving his Gettysburg Address, has white stenciling completed around the red bricks on its north and east sides, and now on much of the west side. This is part of a $35,000 project to paint the exterior of the building located on Gettysburg’s Lincoln Square, or Diamond, or Circle. A three man stenciling crew has been working for four full weeks. This view was taken from the northwest facing southeast at approximately 4:45 PM on Tuesday, October 28, 2008. 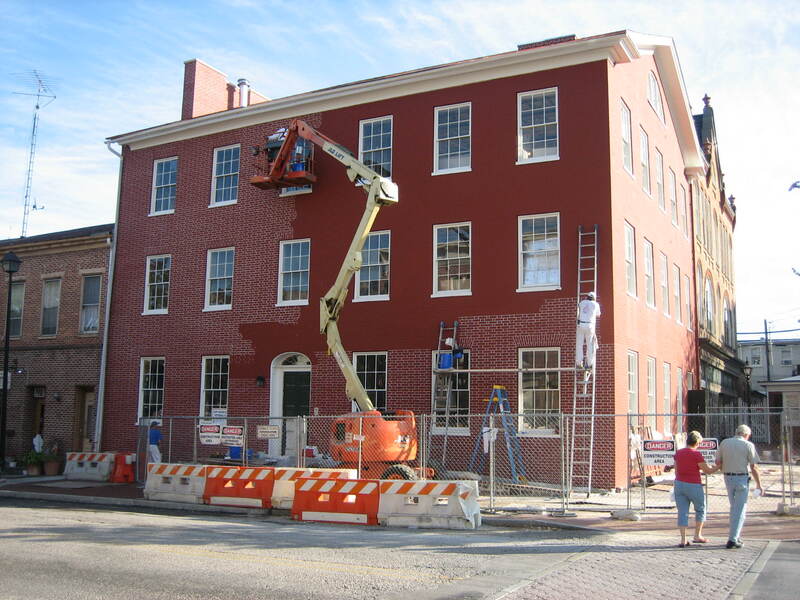 It is estimated that it will take another one to two weeks to finish outlining the bricks for the rest of the building. And then maybe, just maybe, the sidewalk will be reopened. Abraham Lincoln is showing off the new stenciling to “Perry Como.” This view was taken from the southwest facing northeast at approximately 4:45 PM on Tuesday, October 28, 2008. Here’s the view of the David Wills House that Gettysburg merchant and former United States Congressman Joel B. Danner had from his front door on the southeast quadrant of the square. 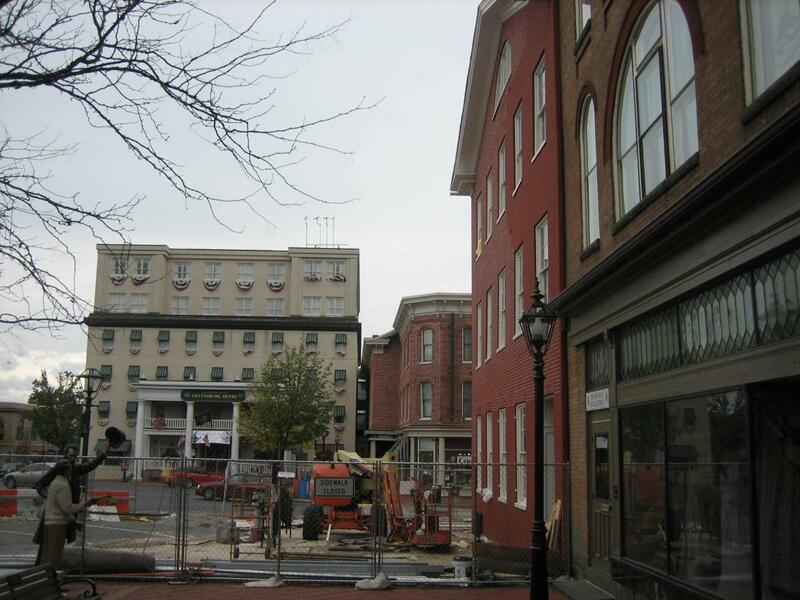 Of course instead of the McClellan House on the northeast quadrant of the square, we now have the Gettysburg Hotel. Before David Wills purchased the Wills House, Danner operated one of eight stores inside the Wills House, then better known as the Cobean building. This view was taken from the south facing north at approximately 4:45 PM on Tuesday, October 28, 2008. 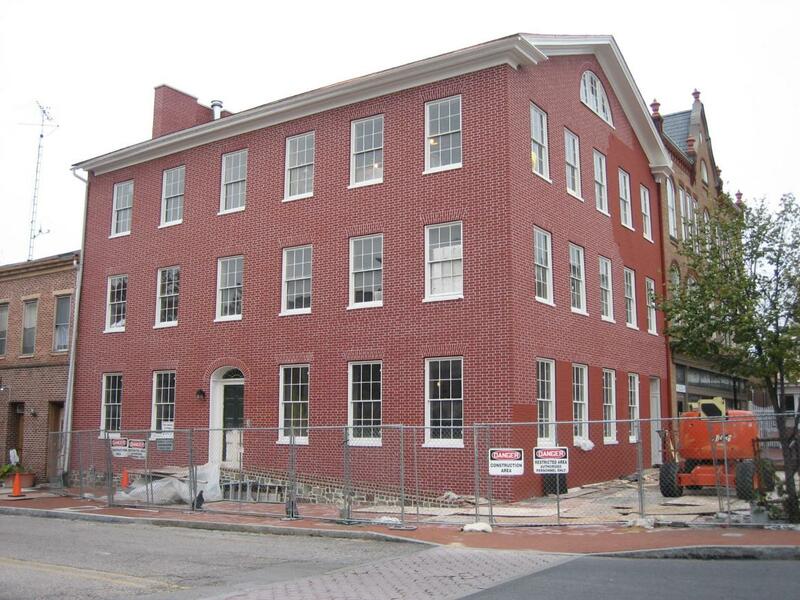 On April 1, 1859 (April Fools Day), David Wills purchased the building for use as his private home and law office. 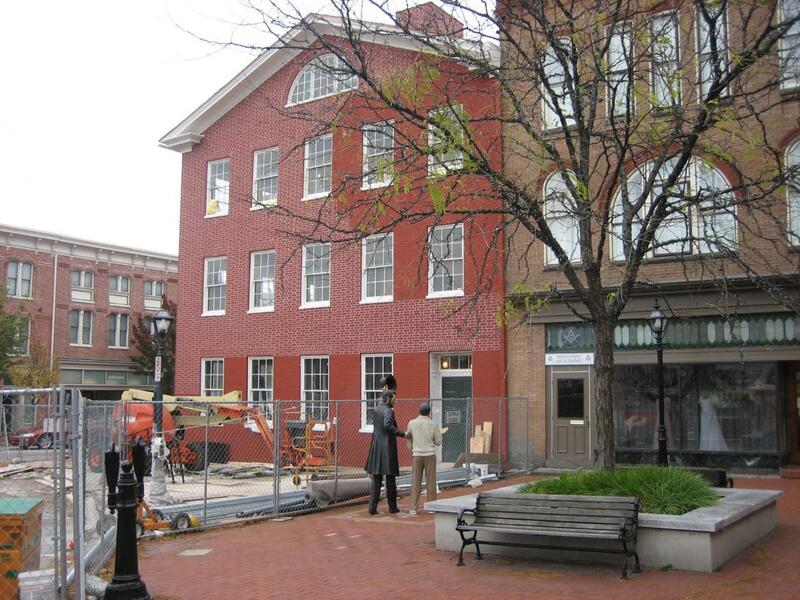 The stenciling on the north side of the Wills House has been completed for a week. This view was taken from the north facing south at approximately 4:45 PM on Tuesday, October 28, 2008. 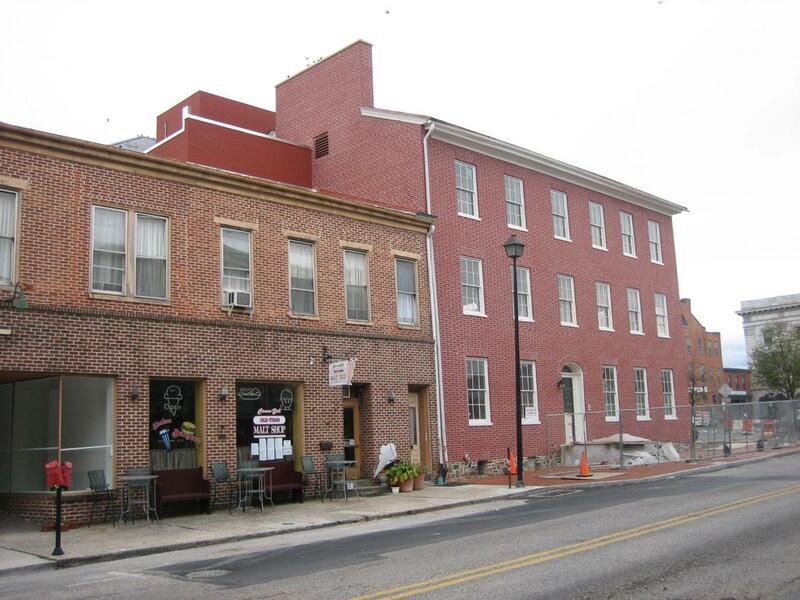 In 1860 David Wills improved his property on the Diamond by building a two story brick commercial structure that connected to the east end of his home. 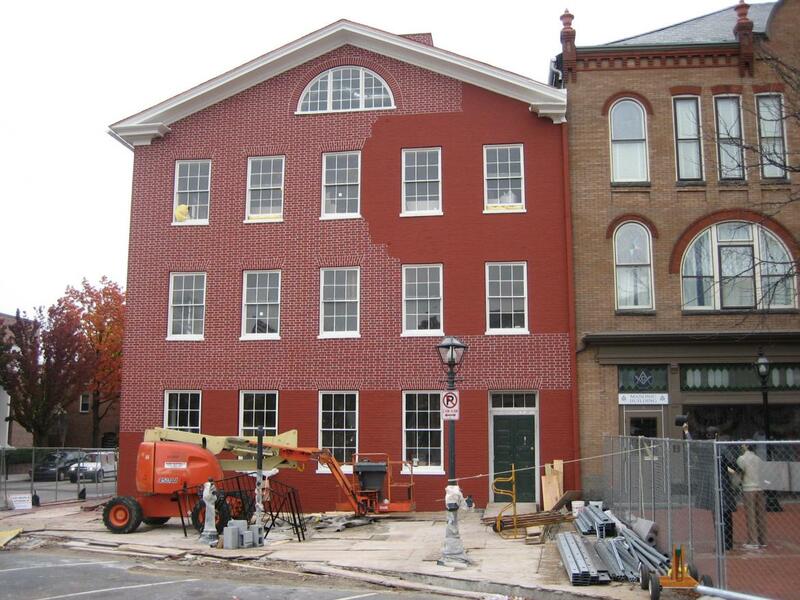 For a number of years the studio of the Tyson Brothers, two of Gettysburg’s leading photographers, was located on the second floor of the “Wills Building.” This view shows that the stenciling work has been completed on the east side of the Wills House. This view was taken from the northeast facing southwest at approximately 4:45 PM on Tuesday, October 28, 2008. The second story of the structure on the east side of the Wills House is known for being the Tyson Brothers studio at the time of the battle. However, it is best known for the artillery shell underneath the third window from the right marked by the small American flag. This view was taken from the northeast facing southwest at approximately 4:45 PM on Tuesday, October 28, 2008. 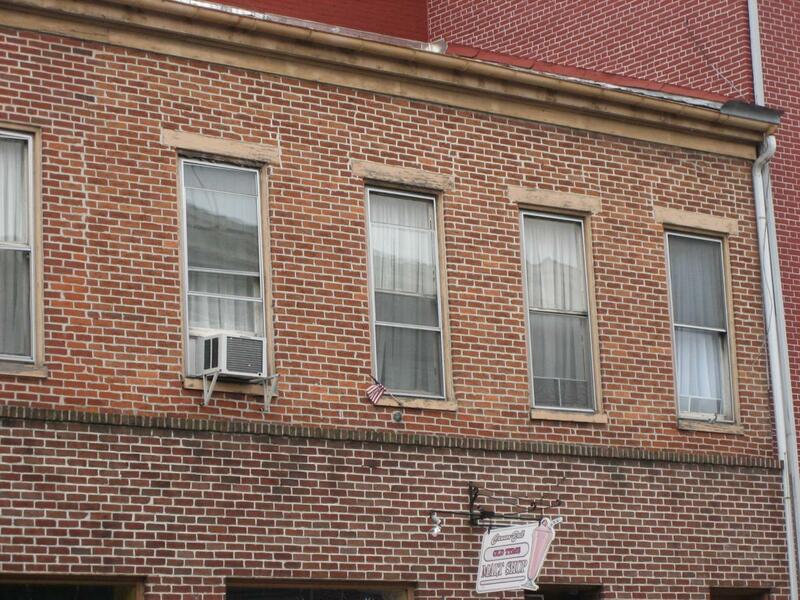 After David Wills’ death in 1894, the Wills House was converted back into a store building. This view was taken from the northwest facing southeast at approximately 4:45 PM on Tuesday, October 28, 2008.